Now that the geography of Fortnite’s Battle Royale map has been transformed by comet impacts, there are several new things players can do in the game. One of them, apparently, is creating a massive lid for the crater at Dusty Depot. Check out our guide to all the new locations in Fortnite Season 4. YouTuber Muselk assembled a team to accomplish this giant project, and it looked initially like it was a fool’s errand. Is it even possible to carry enough resources to create a platform that big? They faced other obstacles as well – sometimes Fortnite’s circles would center somewhere else, dooming the builders to death by toxic rain. Other players would often fail to see the magnificence of the project and fire either at Muselk and his team or the structure they were building. But Muselk’s theory proved correct in the end: once the platform reached a certain size, other players would recognize what was happening and join in. 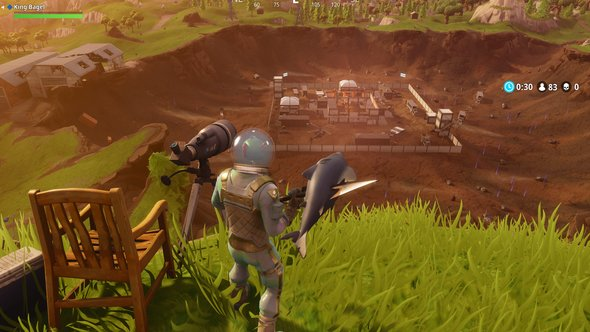 By the end of the video, several squads are working to complete the covering, and they manage to completely seal the gigantic Dusty Depot crater. The project’s scope really becomes clear when Muselk heads underneath and looks up at the improvised ceiling.